We have a gift for you so you could entertain your subscribers with more interactive emails! Omnisend is rampaging in a good way! Over the last few months we have launched a bunch of new features for better user experience and monitoring the email campaigns. 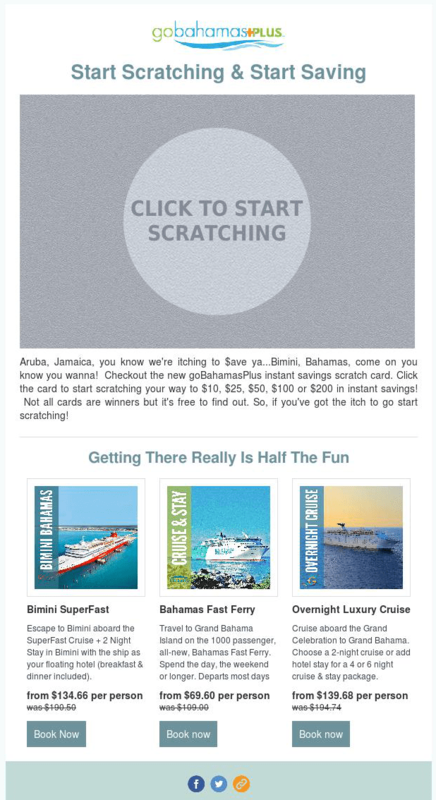 Today we are introducing a totally new thing in the email history – a Scratch Card. It is a new Omnisend feature that allows you to cheer up your subscribers with a fancy interactivity and double or even triple a click rate! What can be better for holidays? How can I use a Scratch Card? announce a lottery with a defined number of winners and let your subscribers scratch for the prize – discount / free shipping / something from your store. Next to the Scratch Card, you can add other text elements/ images or collect the items with a Product Picker. Emails don’t have to be boring! Send a Scratch Card to cheer up your subscribers! When subscribers open the new interactive email they will see your beautiful campaign with an entertaining offer to SCRATCH! To set up an email with scratch card is as easy as everything else in Omnisend. However, we do not leave you alone. In the Knowledge base there is a step-by-step tutorial on how to set it up and define the number of winners. Also check out the alternative to Scratch Card – a Gift Box feature. If you still don’t use Omnisend, try this email marketing tool for e-commerce for free! the scratch card is a very nice idea! thank you! Thanks James for your feedback! We will see what we can do! Very cool new feature! This seems to be a premium feature, is that correct? Can someone from your team reach out to me about this? I would love to implement this for one of my clients.